In my last post, I started to collect my data with the Chrome extension Web Scraper. I have included an expanded demonstration of how I used Web Scraper here (opens in new window). (1) I don’t have much control on what the data structure looks like. (2) If some information is not displayed on the web, the visual-cue-based selectors of Web Scraper might not work. For example, I want to use ‘post ids’ to label each post, but the web page does not display the ids, which means that it is difficult to “click to select” with Web Scraper. (3) If a tag has a child, and there are texts both under and outside the child, it is difficult to “click to select” only those texts outside the child with Web Scraper. Unfortunately, this is how the post contents are structured in html on the forum. This is crucial because I need to separate each post’s original content from its quoted content (if there is any). (4) I can’t find a way to identify myself to the web server of the forum. This is important considering that identifying oneself is one of the scraping courtesies. To deal with these issues, I turn to python. Inspired by Andrea Siotto’s (2016) post on scraping Wikipedia, I thought it was a good time to start learning python and to do some scrapings as exercise. I managed to write a scraper in python to get the data I wanted. It is doable in a few weeks once you have basic understanding of the python language, the data structures in python, the Beautiful Soup python library, and basics of regular expression. The rest is to google for troubleshooting. I’m sharing my codes below and it might not be the most elegant way to do the work. If you have any ideas to improve the scraper, feel free to leave a comment. Also, I hope some parts of the codes would be useful if you are scraping similar websites, or come across similar troubles. Due to the space limit, I am not going into details of what each line of code does. I will explain the general logic of my scraping based on the discussion of nested dictionary in python, and how I dealt with the specific troubles I mentioned above. 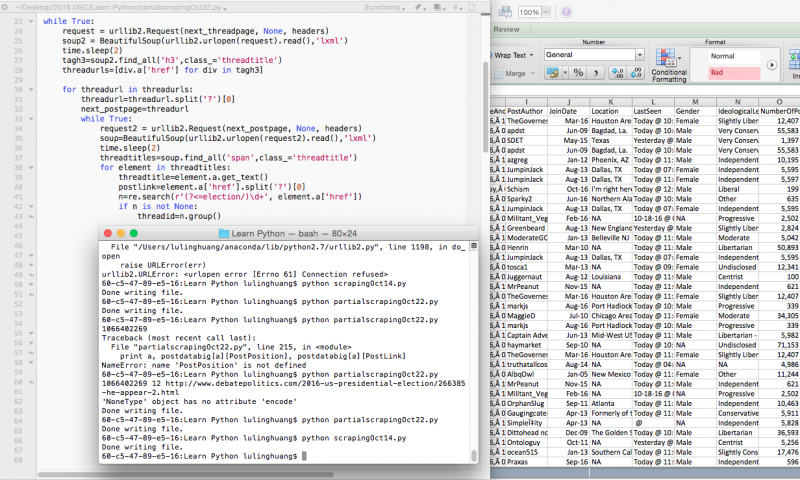 (1) Store the scraped data in python as a nested dictionary. Why is a single nested dictionary preferred to a group of lists? Two reasons: (I) Lists are mutable in python. A list can be easily changed without knowing how changes are made. If, for example, the items in lists are somehow reordered, the resulting csv will present the data differently from the ways measures are originally recorded. If it is a nested dictionary, it is safer because the key-value pair is fixed after being recorded; (II) It is more efficient to search through a nested dictionary than a group of lists. Frances Zlotnick (2014) provides an excellent explanation on this matter. In my case, the unit of analysis is post. Each post has a unique id number and 17 other attributes I’m interested in. Therefore, I assign the ‘post ids’ to be the outer keys and the 18 attributes as 18 inner keys. (2) A big trunk of the codes below (from line 24 to line 125) is doing one thing: creating a list for each attribute containing information that will be used later as values of inner keys in the nested dictionary. This task includes locating the appropriate html tags, looping through the tags and retrieving information, and append each piece of retrieved information to the corresponding lists. (3) The next trunk of code (lines 132 to 157) loops through all the lists together, assigns post ids as outer keys, assigns attribute names as inner keys, and pairs inner keys with the values from the 18 lists just created. (4) The nested dictionary is now created but it’s only for one page at the post level (there are 10 posts maximum on each page under a thread). Some threads have hundreds of posts. Also, at the thread level, there are also multiple pages (20 threads maximum on each page). In total, there are more than 1,200 threads as of 10/24/2016. C. When it finishes scraping at one page at the thread level, loop through following pages at the thread level until no “next page” button can be found (see the “while” loop statement at line 10, and lines 169-175). In this output file, I have already reordered the cases based on thread ids. With additional help of the attribute “post position” (a smaller number means an earlier reply under a thread), it is possible for me to reconstruct the temporal sequence of posts under each thread. The last time I ran the scraper, I collected more than 43,900 posts. It took my personal computer about 4 hours and 40 minutes to run. It seems difficult to only select those texts outside the child tag. My first solution was to replace all children tags with “” (i.e., an empty string). There are two problems with this solution: (1) all text formatting tags would be removed. In the above example, the word “isolate” would be missed by the scraper; (2) sometimes a user would post links directly or post words with hyperlinks, which means there would be <a> tags in the original content. The texts enclosed in these <a> tags would be useful. I would lose this information with the first solution. My current solution is to use Beautiful Soup’s “div.decompose()” to remove only the <div> tags (lines 122-125). It works because I’ve known that the quoted content must be within some <div> tags and the original content must be outside all <div> tags. With this solution, I can preserve as much information as possible. In essence, be nice to the server. First, I included “time.sleep()” at lines 13 and 23, which told the scraper to wait and rest after each request. Second, I ran the scraper during off-peak hours so that the scraper did not disturb too much other users’ access to the forum. Third, I identified myself to the server by including a header (lines 7, 11, and 21). You can find more information on scraping courtesies in Roberto Rocha’s (2015) article. My next goal is to explore pandas, a python library for data cleaning and analysis. I had some troubles in converting a nested dictionary to DataFrame in pandas directly. I may have to write the dictionary to csv, and in a different python script, open and read the csv, then create a DataFrame from the csv. I’ll talk about it in the next post. Why not using https://scrapy.org ? b4s is super cool, but I feel you are rewriting a web spiders. Thanks for the comment! As a programming beginner, I found bs4 really easy to understand. I would definitely love to explore more about scrapy!